The Perseus nanosatellites were technology experiments by the Los Alamos National Laboratory (LANL) Applied Electromagnetics and International, Space, and Response divisions. 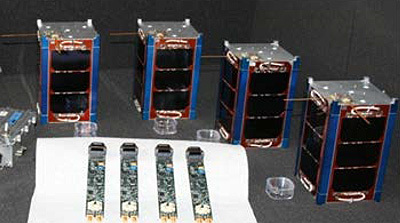 They were built to the cubesat (1.5 U) standard. The goal of the Perseus program is to develop a rapid-response satellite capability to enable many different mission types. The first phase of the effort focused on (1) demonstrating the ability to build and launch a useful satellite quickly and at low cost, (2) gaining cubeSat build and orbital experience, and (3) validating the LANL design methodology (namely, keeping the design simple, designing to the mission, and using commercial off-the-shelf components combined with appropriate design to handle radiation, thermal challenges, and similar considerations for space operation). The satellites were designed and built in less than six months entirely at LANL at very low cost of $25,000 per satellite. The satellites were launched on the SpaceX Falcon-9 v1.0 rocket and have been functioning to the team's expectations. Successful tests include two-way communication, three-way communication (two ground stations and a satellite), and collection of telemetry. The success of this project opens the door to a major new capability at the Laboratory and will allow the development of new projects with existing and new sponsors. The satellites performed as expected until they re-entered the atmosphere after just over three weeks on orbit.